Photo of the day #BBNaija: Between TBoss & Anto, who rock it better? #BBNaija: Between TBoss & Anto, who rock it better? The Ex-housemates of the reality tv show, Big Brother Naija, are looking glamorous in their Nubian looks. The duo were once housemates of the same reality show, albeit in different years. Tboss was in the house in 2017 for the Gobe edition, while Anto was a housemate in the 2018 Double Wahala edition. 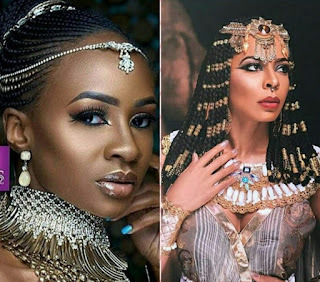 Though the photo session was done separately, both Anto and Tboss look like an Egyptian goddess and slayed in the outfit and accessories that they were adorned with. The photos of these two exquisite women have got fans talking, trying to pick who slayed the look better?